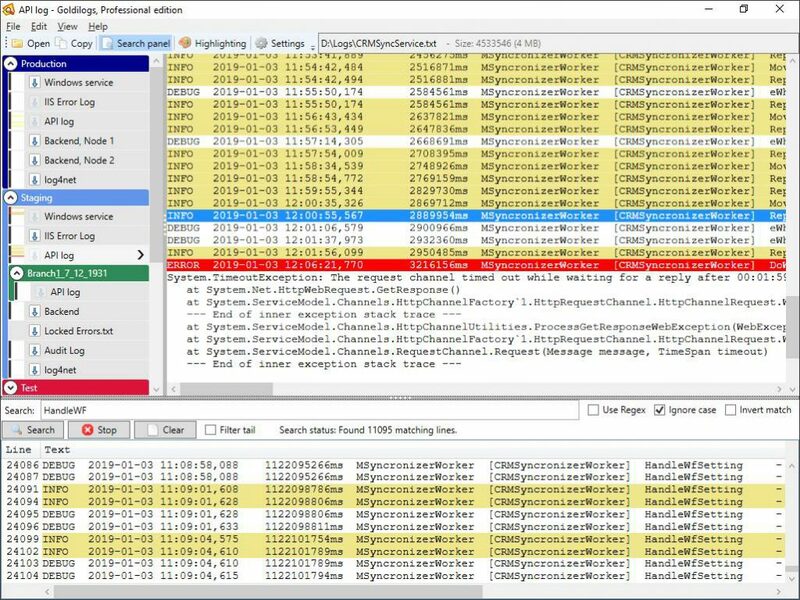 Goldilogs lets you continuously watch multiple log files in real time with low impact on server CPU and Network traffic, yet offers powerful searching and navigation ability. Search as you type for fast feedback. Click search result to instantly locate line in log file. Drag large files directly into the Goldilogs log viewer window and view them instantly. No waiting for the log file to load. Scroll back and forth immediately. Give the log files an easy to recognize name, re-arrange them and group them together using simple drag and drop gestures. Collapse groups to preserve screen real-estate and minimize CPU/Network usage. Supports multi level grouping. 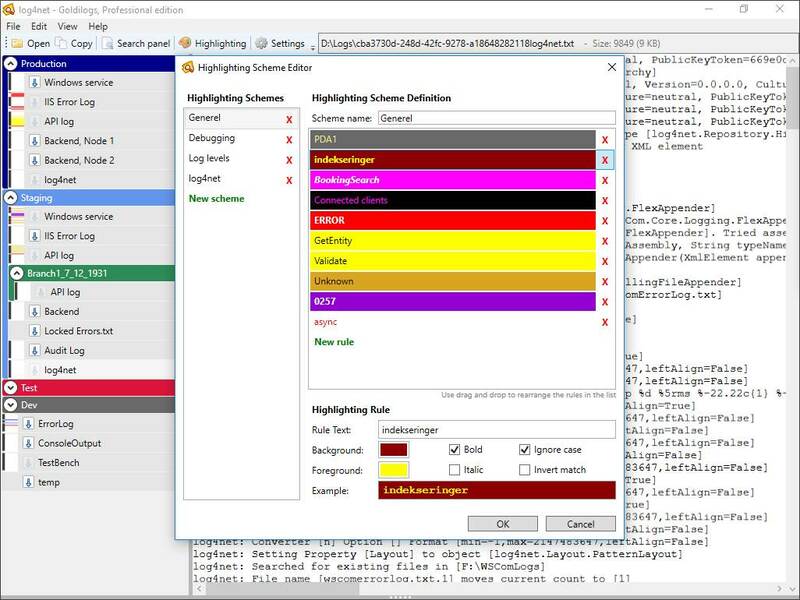 Build multiple highlighting schemes using this nice, intuitive interface. Create rules, define colors and font properties and order them using simple drag and drop. Assign highlighting schemes to individual log files or set one up as default or to be used as a filler AFTER another scheme has been applied. 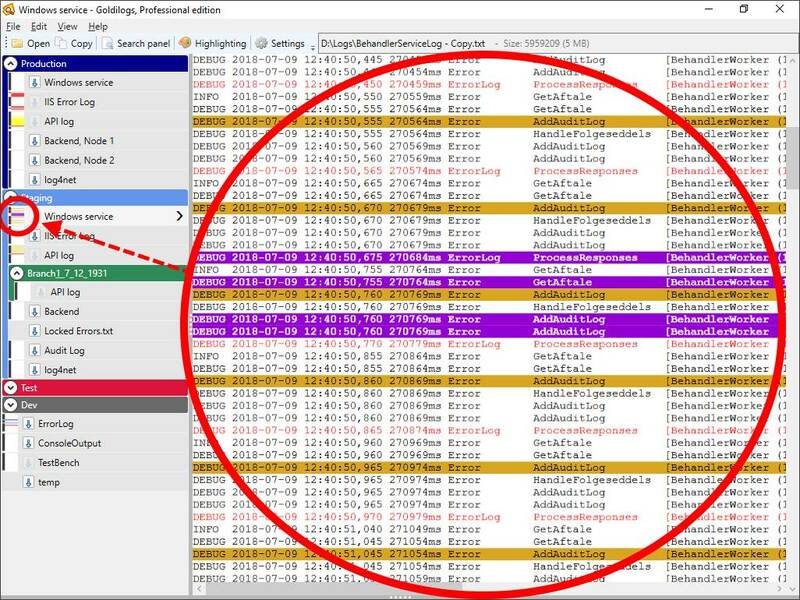 While only one log file can be viewed full-screen at a time, the log file list can display a thumbnail for each log revealing the highlighting applied. 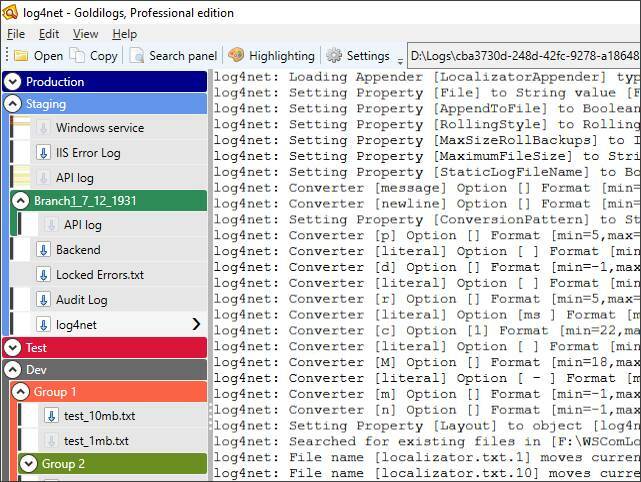 Combined with ‘follow tail’ you have good overview of multiple log files at a time. The thumbnail shows both the highlighting background and the font color. Since the thumbnail cannot display all lines due to the limited space, the colors from the highest priority rule is shown in the thumbnail. This means that if to lines in the log file has e.g. a warning and an error rule, the thumbnail displays the colors from the error rule since it has the highest priority in the highlighting scheme.